The first Sunday in February I decided to explore it’s entire length on foot, small sections at a time. I envisaged using every free Sunday afternoon until I had finished the entire trail, twice. As I am walking this solo, without a lift back, every step would be retraced. Starting at the North Concord end I walked south. Most sections were limited to an approximately an hour walk by using a 30 minute timer to remind me to turn around. When the time was up I identified a landmark, ideally somewhere to park my car for the next leg of the exploration, then walked back. The trail follows the route of the old Southern Pacific Railroad and was established in 1891. The route was abandoned in 1977 and the trail opened in 1986. It skirts through each town making it easy to stop for refreshments, if needed, along the way. Each week I know I’m a little closer to the end. I may not feel any closer. The scenery changes and the mile markers remind me that I am getting closer. At this point, having walked 30 miles, I have covered 15 miles of the trail. 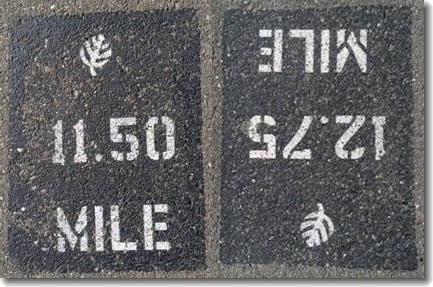 The markings on the path indicate that there are only 9.5 miles to go. I have walked from Concord to Danville, with only two more cities to visit. At both ends of the trail there are extensions planned which will extend the trail from 24.5 miles to 40 miles. Some of that work is anticipated to be opened in the Spring of this year. Just when I think I’m going to be at the end of the trail, I get the feeling that I’ll reach the mile 0 marker only to discover that the trail doesn’t finish after all. I reached the end and wrote more about my walking experiences here.